P114 Looks like a Purse, acts like a Satchel! We know you love your satchels because they carry so much! Buy they’re boxy! Why not have the space of a satchel with the style of a fabulous purse! (12″ x 15″). Plenty of pockets – optional zipper pocket using our polyester zipper pocket technique. Big Pockets Hanger (14″ x 35″), Long Pockets Hanger (35″ x 8′), and Hanger Tote (17″ x 13″) are the three projects for getting things organized around the house. Pattern for four different placemats: placemat with red roses and turquoise border, placemat with coral flowers and light green border, placemat with poinsettias and bright green border, placemat with fall leaves and brown border. The napkin in the pocket completes the motif. Four seasonal placemats for spring, summer fall, and Christmas. The napkin in the pocket makes the top of the character. Size: 20 inch by 13 inch. Four similar purses with different handle versions. Features Cover Purse Handles. The size of the purse is 12 inches by 8 inches, a great size for teenagers. Bright fabric with circle-shaped handles, country fabric with u-shaped handles, ethnic fabric with u-shaped handles, and blue/yellow fabric with strappy handles. Five pillow styles from which to accessorize your favorite room! Layered blocking makes them easy! Square pillows use pre-purchased pillow forms and the neck rolls show you how to make your own pillow forms. Fat quarters work great for this pattern if desiring different fabrics for pockets, backgrounds, pin cushion, and trims. Four 14″ x 22″ wall hangings perfect to decorate your home and welcome your company. Use 100% cottons for fabric and batting. Fabric requirements are based on 44 inch (112 cm) wide. If there is a vertical pattern on the fabric you selected, you may need more fabric. Greet your friends with this whimsical 22 inch Santa hanging on the front door. Constructed with white terry, plush felt, this is one of our best selling patterns from our set of earlier patterns. The instructions cover the wings, body, arms, legs, ears, and head. This littlest bear is one of the designers favorites. Parts of the pattern: body, shirt, shorts, hair, face, shoe laces, embellishments. Embellishments include: seed bag, ladybug, space, flowerpot, sign, necklace. This site only shows discontinued patterns. 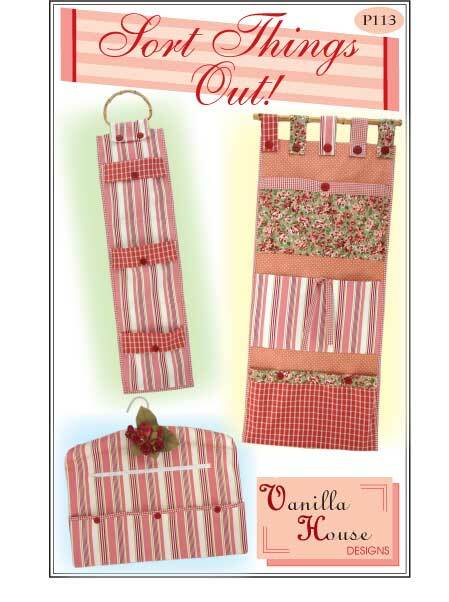 Please visit the Vanilla House Designs website to see the current pattern offerings.